Collectors attending tonight’s dinner at the Philly Non-Sports card show got an early Halloween Treat. 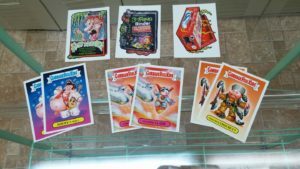 All attendees received two officially licensed cards, one GPK and one Wacky Packages. 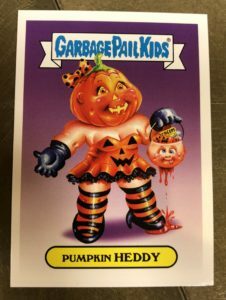 The GPK card, Pumpkin Heddy, was painted by Joe Simko. The back is numbered 1 of 4. 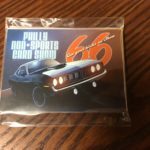 The back advertises collectors can complete their set at next year’s spring Philly Non-Sports show. 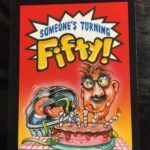 The Wacky card was painted by Fred Wheaton. 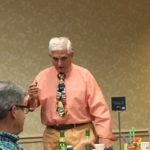 Collectors were also treated to a talk by artist Smokin Joe McWilliams during dinner. Thanks to Collector Dave O. for the images! 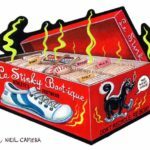 Do you like Garbage Pail kids and Wacky Packages? 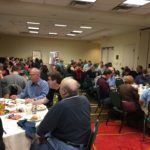 Will you be in the Philadelphia/Allentown area this weekend? 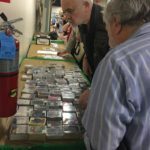 Then you need to make time to stop by the largest and longest running Non-Sports Card show in the US. 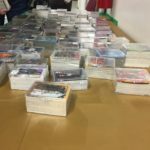 The biannual Philly Non-Sports Card show is ready for collectors from around the country to pay a visit. 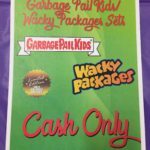 The show is focusing on GPKs and Wacky Packages over their next two events, starting with this weekend’s show. Those attending the show have a lot to look forward to. The artist lineup is a strong one. Set to attend are Tom Bunk, David Gross, Joe Simko, Smokin’ Joe McWilliams, Layron DeJarnette, and Chad Scheres. 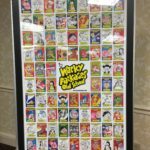 The artists will have plenty of original GPK and Wacky art, prints, sketches, and merchandise available for sale. 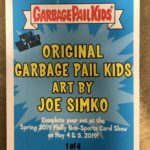 There will be a card talk prior to the show opening on Sunday morning. Those who have already reserved a space will have a chance to to ask questions of their favorite artists. The traditional Saturday dinner is sold out. Collectors attending the dinner are in for a treat. 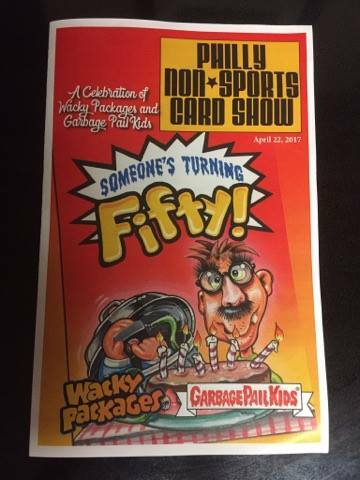 GPK and Wacky artist Smokin Joe McWiliams will be the guest speaker during dinner. 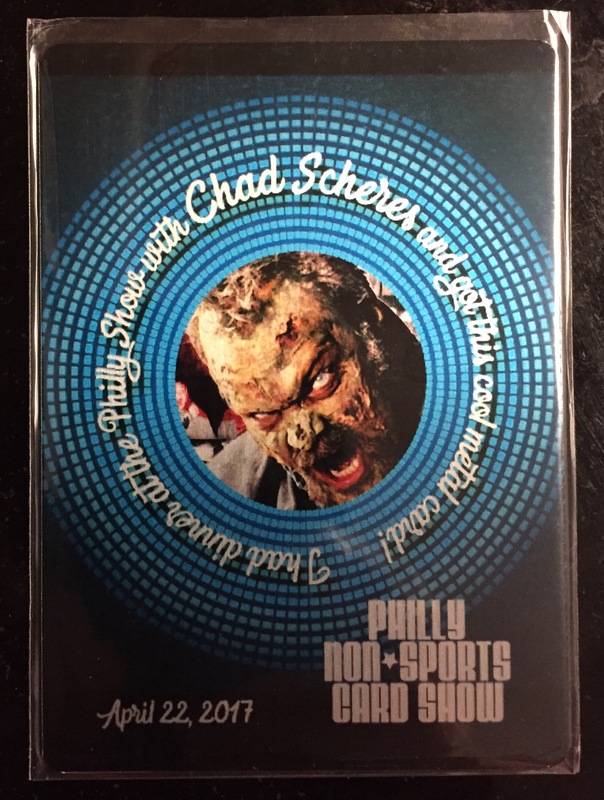 There will also be prizes given out at dinner from Creepy Co, Fright Rags, and Chad Scheres. Attendees will also get two exclusive Topps licensed promo cards. The Halloween themed cards are painted by Joe Simko (GPK) and Fred Wheaton (Wacky). The cards will be numbered #1 & #2, with #3 and #4 coming at next year’s spring show. 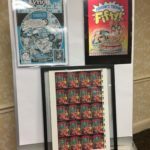 While show organizers are keeping the art under wraps until Saturday’s dinner, they are showing another card that will be given exclusively to dinner attendees. 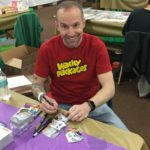 Tom Bunk created the Wacky Garbage Kids parody card for the dinner. The promo cards don’t stop there. 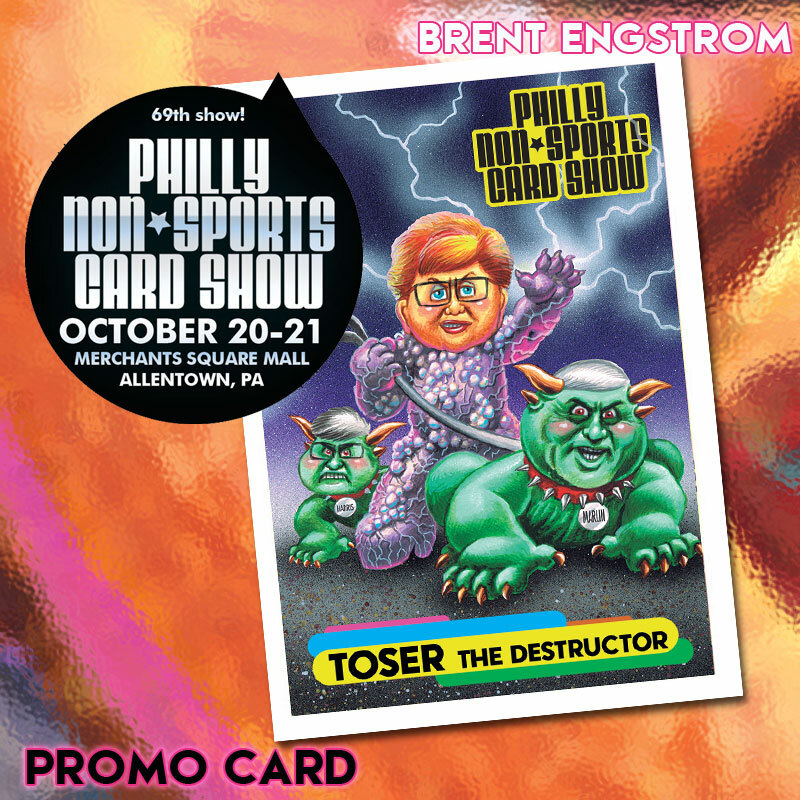 All show attendees will also received a new Horrorible Kids promo card from Mark Pingitore, as well as the Toser the Destroyer card done by Brent Engstrom. 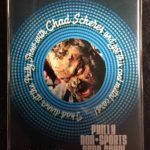 There will also be plenty of other non-sports promo cards given out at the show. Show organizers are also planning a special drawing on Saturday for all kids under 12 years old. Kids will receive near completed sets, and will be encouraged to trade at the show to complete their sets. There will be many other booths that specialize in selling non-sports cards. This show has a different vibe than the Gross Card Con shows, which are primarily a toy show. If you live within driving distance you need to find some time to attend the show with the whole family. 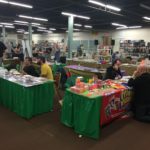 The show is set to take place this weekend at the Merchants Square Mall in Allentown, PA. The show will be open on Sat. Oct. 20 from 10:00 AM – 5:00 PM, and Sun. 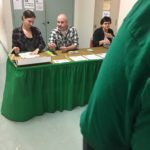 Oct. 21 from 10:00 AM – 3:00 PM. 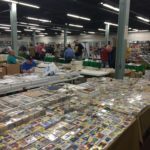 In just over three weeks collectors from around the country will gather for the latest non-sports card show in the US. 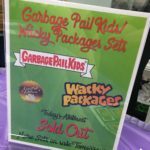 Set to take place at the Merchants Square Mall in Allentown, PA the fall show will focus on Garbage Pail Kids and Wacky Packages. The show announced just a couple of weeks back there will be a number of promo cards available at the show. Yesterday show promoters showed off two of those. 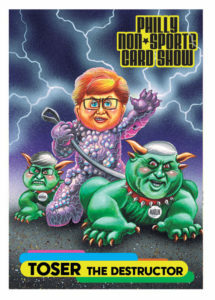 Numbered 1a and created by GPK artist Brent Engstrom , the first promo card features show promoters, the Tosers, reimagined in a GPK style Ghostbusters parody. 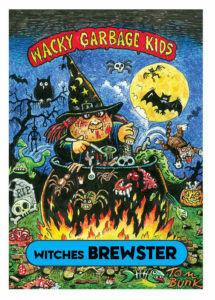 The second card is a promo card for series 4 of Mark Pingitore’s fantastic Horrorible Kids upcoming set. 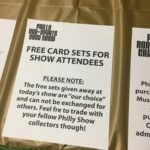 Collectors can receive both cards with their paid admission to the show, while supplies last. The show will take place the weekend of Oct 20-21. 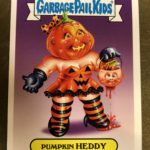 In just over six weeks Garbage Pail Kids collectors on the East Coast will have an opportunity to mingle with some of their favorite GPK artists. 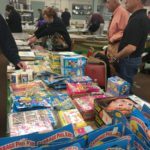 The biannual Philly Non-Sports Card Show will once again be ready for collectors on October 20 & 21. 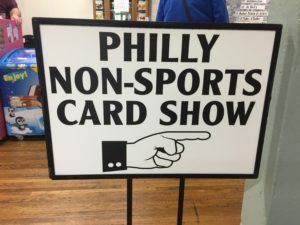 The Philly show is the oldest non-sports card show in the country. The upcoming show in October will be the 69th Philly show. The show, which is actually not in Philadelphia but instead in Allentown, PA, takes place at the Merchants Square Mall. 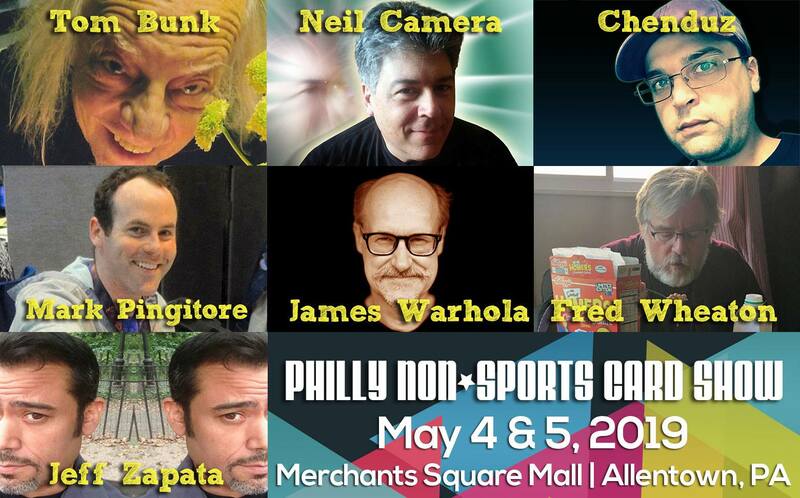 With each Philly show there is a focus on a certain non-sports brand. 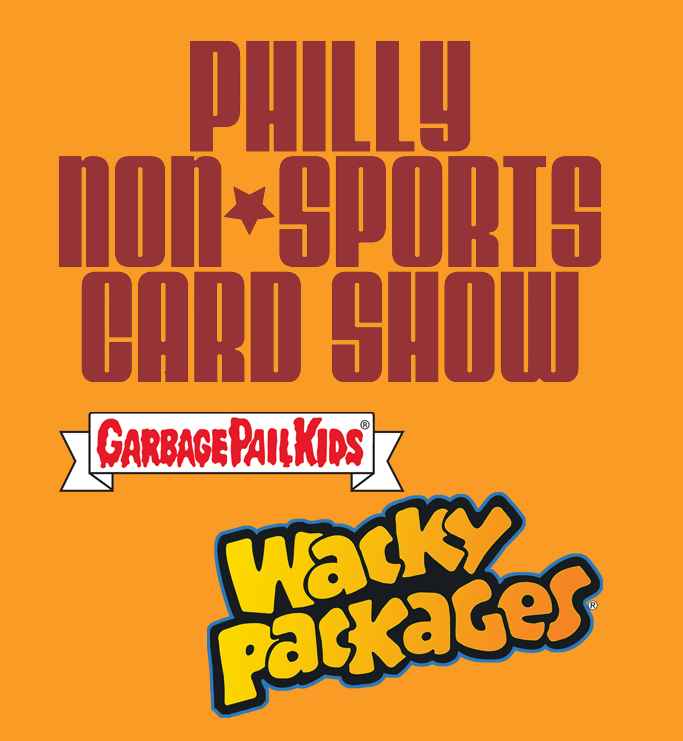 Show organizers are going all out, with the next two Philly Non-Sports shows being GPK and Wacky Packages focused. 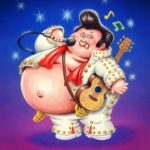 The artist line up for upcoming show has six top notch current and former GPK artists. 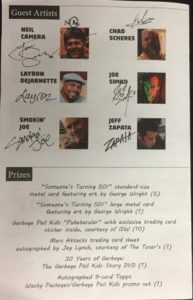 Former original series artist Tom Bunk will lead a group which includes current artists; David Gross, Joe Simko, Smokin’ Joe McWilliams, Layron DeJarnette, and Chad Scheres. The artists will all be on hand selling original art, prints, stickers, cards, and more. 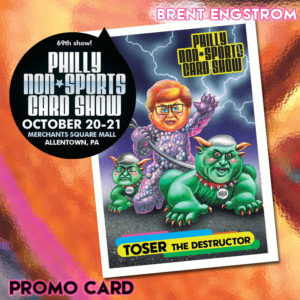 Show goers will receive a promo card created by Mark Pingitore. On Sunday, prior to the show opening, there will be a Card Talk panel discussion with all the artists. All the artists are happy to meet the fans. 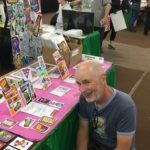 This is a great time to get some quality time with your favorite artist, and help support their art. 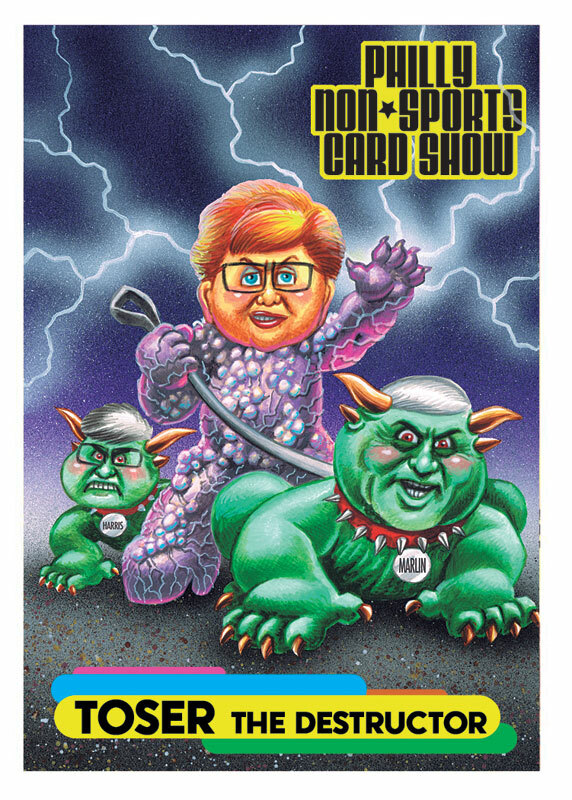 With the show focus being on GPK and Wacky Packages, there will be some promo cards available. 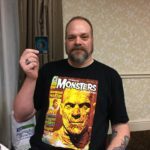 First off, all attendees to the show will receive a promo card painted by Brent Engstrom. 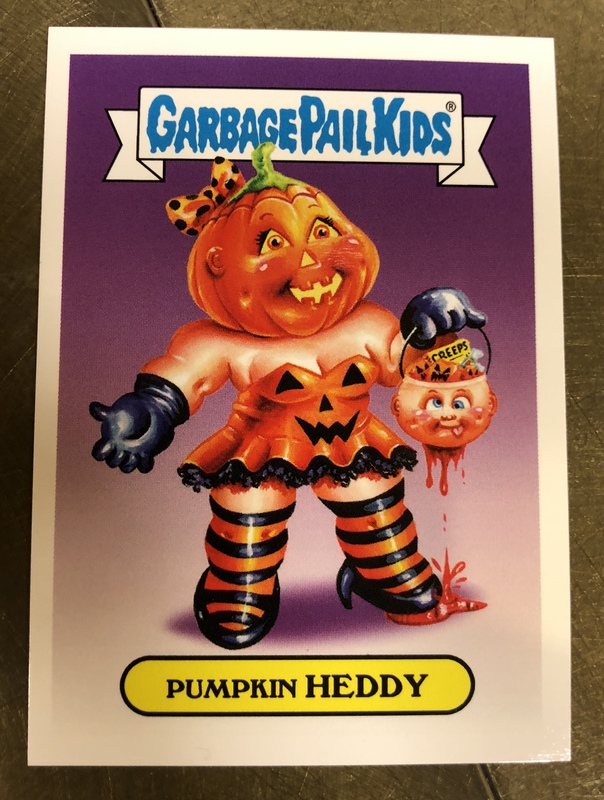 Second, everyone attending the Saturday night show dinner at the Airport Hilton Garden Inn will receive two Halloween themed cards, (one GPK, one Wacky), painted by Joe Simko and Fred Wheaton. The cards will be numbered #1 and #2 in a set. Tom Bunk will also paint a card for dinner attendees. 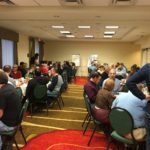 The dinner will be limited to 64 attendees only, and will cost $17.95 per person. 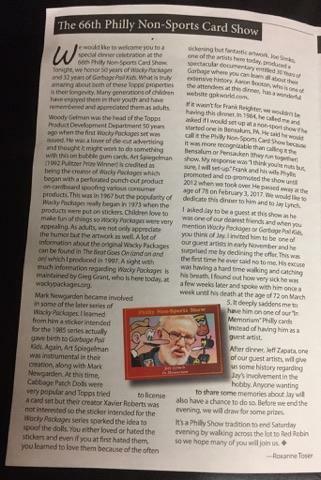 Topps has chipped in with a generous donation to help with the artists and to reduce the cost for collectors attending the Saturday night dinner. Smokin’ Joe McWilliams is set to be the guest speaker at the dinner. 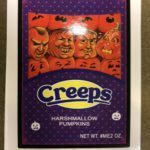 There will also be prizes from Creepy Co. and Fright Rags. Dinner tickets will sellout. To reserve your spot contact Roxanne Toser at roxannetoser@gmail.com. 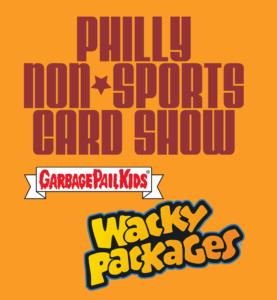 As mentioned above, the focus on GPK/Wackys doesn’t stop with the October Philly show. 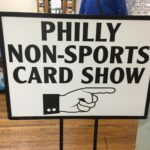 The 70th Philly Non-Sports show will share the same focus. 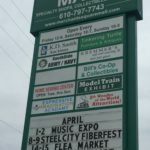 Show organizers already have a number of things planned for the show taking place on May 4 & 5, 2019. The artists scheduled to attend are Tom Bunk, Mark Pingatore, Fred Wheaton, Jeff Zapata, James Warhola, Neil Camera, and one more TBD. 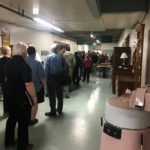 In order to help defray costs for the artists attending the show, they are looking for people to sponsor artists for $250. A couple more sponsorships are available. Sponsors will receive a full color sketch from the artist they sponsor. If interested in sponsoring an artist e-mail Roxanne Toser. The May 2019 show will also feature the next two promo cards in the show dinner set. The cards, #3 & #4, will feature a spring theme and be painted by Layron DeJarnette and Chenduz. 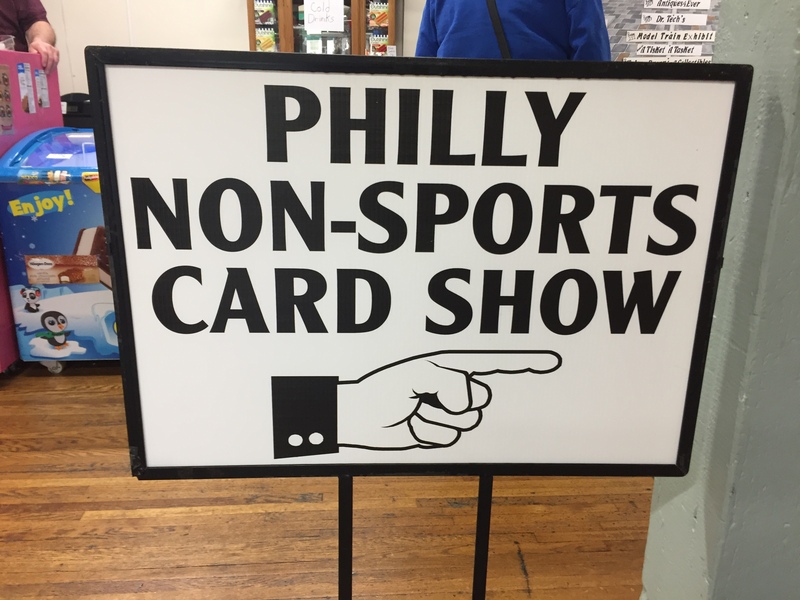 The Philly Non-Sports show features a much different vibe than a Gross Card Con show. With a more relaxed atmosphere, the show floor features nothing but tables selling various non-sport cards. 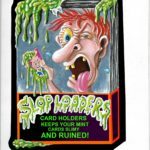 This includes of course a number sellers with GPK merchandise. The show hotel is the Airport Hilton Garden Inn, and a special show rate of $97 is available. Show tickets are available for $8 per day, or a two day pass for $14. The show will be open from 10:00 AM – 5:00 PM Saturday 10/20, and 10:00 AM – 3:00 PM Sunday 10/21. 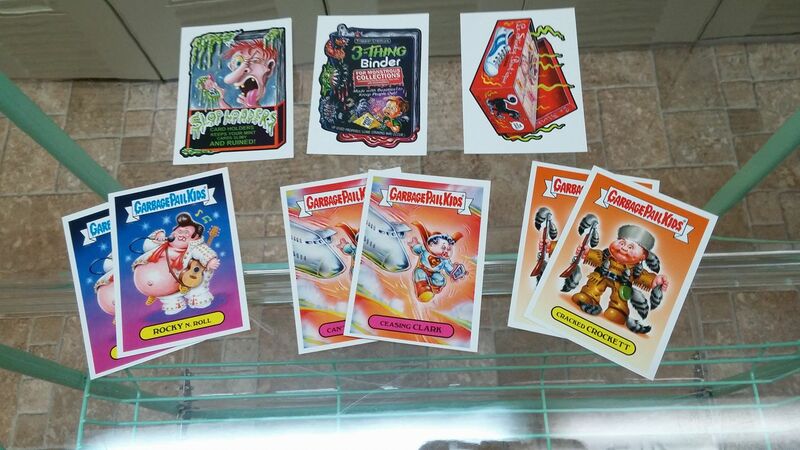 East Coast collectors, don’t miss your chance to meet your favorite GPK artists. 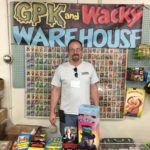 GPK collectors attending the spring Philly-Non Sport show recently had a chance to hang out with numbers GPK artists, and shop for the latest GPK merchandise. 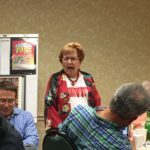 Part of the weekend’s festivities was a Card Talk. 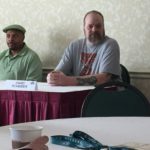 Five attending GPK artists gathers early Sunday morning before the show opened for a one-hour question and answer session with fans. Stephen Sodergren and Erica Fox were on hand for GPK News to cover the event. 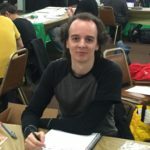 In this third and final article they transcribed the entire card talk. 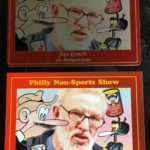 If you missed the first two articles on the show be sure to check out, Philly Non-Sport Dinner/Jay Lynch Tribute Transcript and GPK Collectors Enjoy Weekend at Philly Non-Sport Show. Thanks to Erica and Steve for the fantastic job reporting on the show! 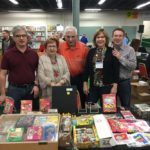 Garbage Pail Kids and Wacky Packages collectors all gathered recently for the Philly Non-Sport card show. 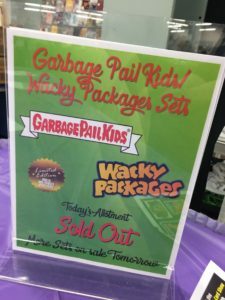 Held twice a year in Allentown, PA, this year’s spring show was themed GPK/Wacky Packages. Part of the festivities included a limited dinner Saturday night at the host hotel. During the evening was a tribute to artist Jay Lynch. 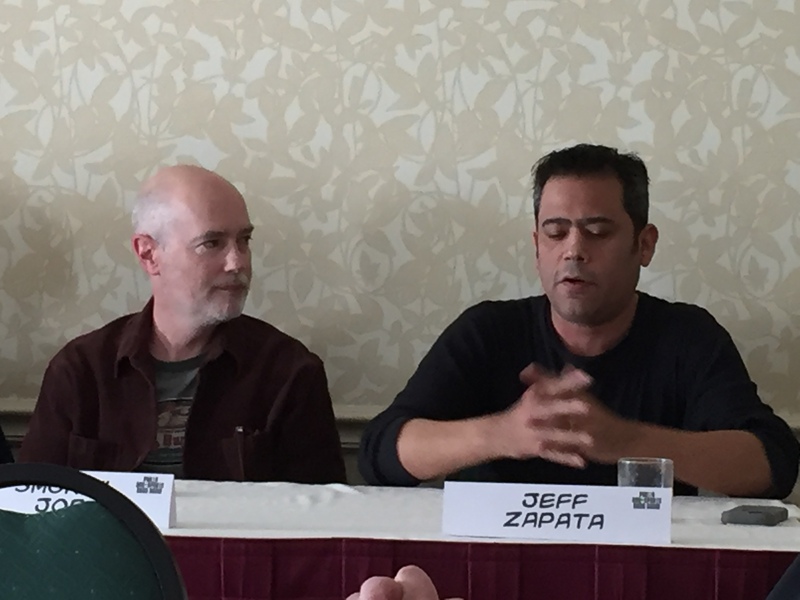 Led by Jeff Zapata, many of the artists and attendees shared their memories and stories of their time with Jay. 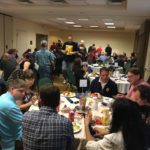 Attending the dinner were collectors Steve Sodergren and Erica Fox who were kind enough to transcribe the tribute for us. 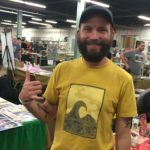 If you missed it, be sure to check out Steve and Erica’s great write-up on their experiences at the show. 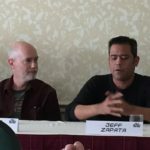 Jeff Zapata: Jay was someone I could really gravitate to right away. 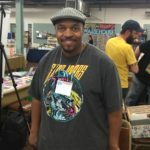 He was a person that you could talk about pop culture, you could talk about the old artists of TOPPS. 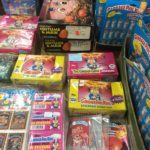 And to us TOPPS had these ideas, these toys, these things. It was almost like an old car that was locked in the garage and we could just take off that tarp and turn on that engine and it would still sound the same. And when we came to this show, that car was always there. It always sounded the same. And you can’t have that car sounding the same without people who all believe in the same thing, who really love what they do, who really love what they collect. Jay really appreciated that. He treated everyone as an equal. It didn’t matter who you were. It didn’t matter what type of artist you were. He felt as an equal with the person, and that was really a special thing – and also I think about this show -it doesn’t matter who you are, it doesn’t matter where you come from, we’re all the same. We all love the same thing. And a lot of that could not happen if not [gestures to Tosers]. So thanks to Tosers, and especially Roxanne who organizes such things and takes a lot of patience, organization, and a lot of love. Jay recognized that love and I would like to give a hand to the Tosers at least [applause] who continue to bring new friendships like that. I probably would not have had the friendship I had with Jay if it wasn’t for shows like this. One of the ways that Jay and I started becoming friends was non-sports – new product development was talking about stuff but eventually he had a divorce which happened to each of us – or each year talk about divorces, or our marriages, or our kids – how they’re growing up and everything, and Jay had a divorce and he needed friends and I know some of us here helped him out when he was doing that. Matt and Greg are a few over there, or New York city friends who helped, and Art – and because of that I got to know even more people – Art Spiegelman and other people intimately. But it was because of a belief, it wasn’t because we got to just meet each other – it was about cards, always was about cards. It was always about cards – about prosperity, not to give up and denounce, to prosper, not to starve, to achieve, not to plunder ideas. And Jay always was with that – to constantly keep doing stuff. And when I see everyone today, right now, looking at everyone, I still – I see him in a lot of you guys and he would be very proud that we’re having this moment to think about him, to think about the hobby, think about the Tosers, and I’m just very proud of everybody here today and I’m proud that we’re thinking about Jay. I just hope there are other Jay Lynches still here – and I know there are – but I hope we still always take a moment to remember him when we do something in the way that he would like to have it done- with honesty of who are – who you really are – not who you’re working for. I see it in all here today, so God bless you all and I hope to see you more throughout the years and remember times such as these, and future things. And if anybody else would like to get up and talk about Jay and have things to say – I know Mike Jaspersen might have a really funny anecdote that I thought was great and any other friends, please join in as part of it. 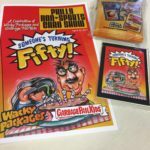 I would like to also mark the occasion of the 50th anniversary of Wacky Packages and everyone who supported it throughout the years especially when it was dead [laughter] [applause]. 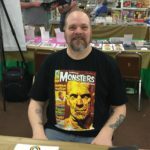 I thank you guys for acknowledging the work of Jay Lynch, Norm Saunders, Art Spiegelman, my good friend Len Brown, and others. And I hope you give each other a hand for coming here and taking long journeys – I know some of you come really far and I would like to [clapping] I would also like to thank Joe Simko, Layron DeJarnette for coming, a lot of the other artists who work for GPK and TOPPS, for coming and taking their time to celebrate this moment. Enjoy your dinner! [applause]. I said, “Really?” and he said, “Yes.” So I said, “Well what did you do?” He said, “I worked with underprivileged kids. So I’d have them in the room and I wanted to communicate with them but I didn’t know how to do it. So I started rapping, and they would rap back to me. So I invented rap.” I said, “That’s a great story.” He said, “Yeah, there’s a guy who’s doing a book – he did a book on the history of rap and devoted a whole chapter to me. I said, “Wow, I gotta get this book, Jay.” He said “Oh there’s only one thing….umm…. the author died before it was published [laughter].” So, I don’t know if it’s true or not true! But, that’s just the kind of stuff Jay would do. I didn’t know him as long as some other people- maybe only eight or nine years, 10 years maybe, but I really liked the guy and he was good to everybody and I’m gonna miss him [applause]. 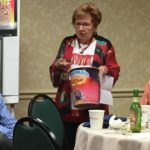 Jeff Zapata: Anyone else who has a story to share of Jay? Roxanne Toser: I always knew Jay – [unintelligible] – when we were in Chicago with Jay’s friends. I guess we were there for a national baseball card convention. And so we had stopped in the hotel with Jay, and Carol, his ex-wife, who he would always blame Marlin for marrying her. They lived together for quite a while and Marlin would day, “Why don’t you two get married?” So, they finally got married and then he’d blame Marlin [laughter]. But anyway, we were in the lobby of the hotel and some people came in that knew Carol. They talked to her and they were very enthusiastic and finally they looked at Jay and they did not know him. They said “Um, and what do you do?” And Jay said, “I work for Non-Sport Update magazine.” That was his claim to fame. I said, “Jay, if that’s your claim to fame then that’s pretty pathetic” [laughter]. That was Jay. He was always very unassuming, and he did not say I’m a great artist from the underground days or anything like that. Just, you know, he worked for Non-Sport Update. So that’s one of the many, many memories I have of Jay. Marlin Toser: Jay would call Roxanne up on the phone. I’d answer the phone and he’d say “I’m Jay” or “This is Jay.” So there was an artist around who did work for us on Non-Sport Update. His name was Grass Green – don’t ask me how he got the first name [laughter]. But Grass Green told me, “I’m going to Chicago, and I’m going to meet Jay Lynch! I’m so, so – I’m really so happy.” So he gets to Chicago and he meets Jay Lynch. “I’m Grass Green.” “I’m Jay.” You know, Jay was so unassuming that no matter what he did he never bragged about anything he ever did, you know? And sometimes I would talk to Jay and it would be Monday and I thought it was Tuesday or Wednesday because he would go in such detail I wouldn’t even know whether I asked him on Monday… I’m like, “Jay what are you talking about?” [laughter]. You know it was really delightful and I really miss him. 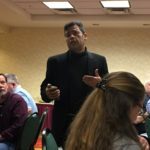 Jeff Zapata: Anyone else with any stories to share on Jay…? 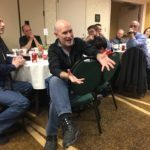 Mark Shoemaker: No [laughing]! My two greatest memories of Jay are- I had the honor of going to two Chicago shows back during the late 90s – the only two that I’ve ever attended out in the Midwest. Everything else has been in Pennsylvania or New Jersey, and I’ve enjoyed all those as well. 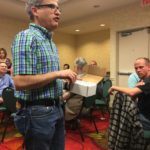 But I got the honor to go to Jay’s apartment in Chicago with a few of the guys mostly from California- like Scott Roberg and John Millard and Tom Tyson from Wisconsin, and a couple of others. And we were at Jay’s apartment one night and all the guys were looking at me like “Shoe, why are you falling asleep in such a great apartment tonight?” [laughter]. I said, “I’m just tired! It’s been a long trip.” But the man – I mean – as soon as he put pen to paper- he was incredible. He was the grandfather of all Wacky guys to us and we’ll miss him and we love him dearly. The other memory was in ’05 at Greg’s gathering at his place and he did sketches for us all night and he took photos. Cheryl [Cheryl Sweppy, fellow collector seated next to him] and I were a part of the group and many others. 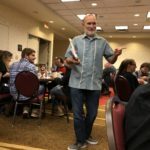 There’s many photos that have been posted lately on the gatherings, like from ’02 and ’05 – and ’99 was a big one with Jeff Weiss for anybody that remembers that one. So, Jay we love you and miss you and thank you for all the memories [applause]. 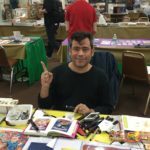 Jeff Zapata: Does anyone else…. I might just have one memory to share just personally- cause that was a general speech but does anyone else – please, speak up..
Smokin’ Joe: [gestures] I have – just – briefly. When I first started doing Wackys I wanted to get in touch with the classic artists and writers and get as much input. Hey, if I’m gonna pick up the mantle I want to know something, I want you to hand it to me. So I reach out and call Jay and talk to him and he gave me some advice and everything. And a couple of years later, out of the blue, he calls me, “Hey I’ve got some ideas on some stuff and I thought maybe you’d work on them with me.” So I go, “What are your ideas?” It was 2008. 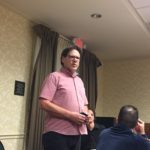 He goes, “I want to do these – for kids – alright, I want to do these stories. And it starts out – it tells a story and there’s a piece of artwork there and the story starts out in like, 10 point font and a couple of lines tell the story there. And then it moves down to like 6 point font and it gets smaller and smaller and smaller.” And he’s like, “People keep telling me nobody will be able to read it but the kids will be close [laughter] and the kids will be able to see it- [laughter] – it’s for the kids – and they’ll know it’s for them alright? Here’s one of the stories just so you have an idea.” He’s like, “Okay, back in the day, we’d slick our hair back all the time, grease it back, and some of the people would use egg white if they couldn’t buy the grease or whatever. So the story is this kid goes and uses egg white to grease his hair back and he jumps on his bike and he’s riding through the summer, through the town and everything, and it’s a hot day and all of a sudden the egg white starts cooking [laughter] on his head. Pretty soon he’s got like scrambled egg hair. That’s the story!” [laughter] “What do you think?” “Well, ok!” [laughter]. So there you go, phone call with Jay. [applause]. 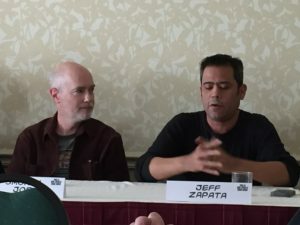 Jeff Zapata: Well, I think a lot of people had like a lot of famous phone calls with Jay. 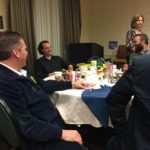 Jay was the type of person you could – he would call you at like three in the morning- and I’m hearing some stories now – and you might see some tears in my eyes only because it reminds me of my interaction with him and everything. 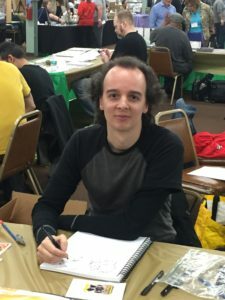 I had a really personal privilege to get to know him as a roommate, a drawing buddy, a convention partner type of thing. I was very proud of that – I was so privileged to be that- it was like I felt like I was in Back to the Future and he was Doc [laughter] and I was like there, “Doc! Where are we going next? What are we going to do?” And he’s like, “We’re going to Pennsylvania … [laughter] to meet the Tosers.” But it would be great. But I got to tell you that it’s almost like a Houdini thing – I want it to be that it’s like legend to see this person – cause I’m gonna tell you like I would – you’re living with a person in an apartment and I would draw some stuff – and I’m a pretty quick drawing type of person, whatever. And I would go out, walk the dog or whatever, and I would come back – and I’m telling you, this is legend – like, I would see something that looked like it took eight hours. 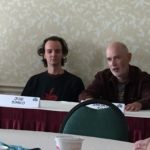 And if it’s anything from any artists over here – legends are true – where, like if he was comfortable in a certain situation – and he was in a rhythm – not like convention rhythm- and you would come back and it’s like how did you do that? And sometimes I would just sit there to, you know, watch water boil and I would just see an ancient technology – just – a person that would just do things like a computer. And Art and I talked about this for hours recently, so that’s why I’m also saying it because it was something to see, to behold. It was a marvel. And I just want it stated that like we saw something, you know, that maybe we won’t ever see again. But someone who really knew how to took a rapidograph and take lines and really make them alive. And not only that, but a person who knew how to make good friends in a secret way and intertwine people. Cause look at us – we’re all intertwined because of Jay, you know. So, Jay, I love you man [applause]. Roxanne Toser: Okay, that was very nice. 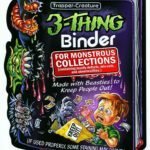 Roxanne Toser: Now we’ll do prizes…..